I absolutely love the idea of bullet journals. I especially like checking out the beautiful images of bullet journal spreads on Instagram and have watched many, many videos on YouTube. The only problem is that no matter how hard I try to duplicate what other people have done, my spreads and pages always turn out looking like a five year old did it. What inevitably ends up happening, is me abandoning my bullet journal, which is truly sad. I don’t know how or when bullet journaling turned into its own unique art form but for those of us with absolutely no creative talent or vision, it’s hard to get into the habit of bullet journaling when all we see are mistakes, cross outs, uneven lines and child like doodles. 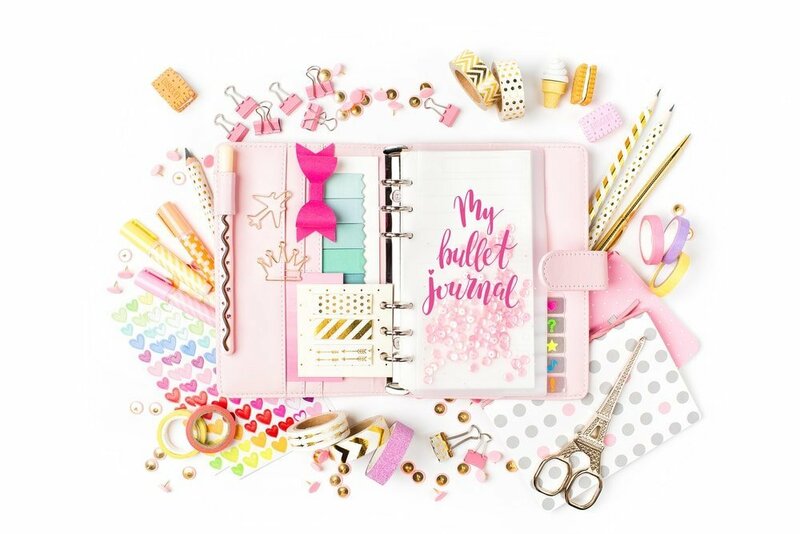 If this sounds like you too, you probably have a strong case of bullet journal envy. And the only way to overcome that is to get back to the basics and remind yourself that bullet journaling is not about pretty spreads but an organizational tool. Stop drooling over Instagram images and get to work on making your bullet journal work for you first. Then you can use some of the bullet journal hacks for non-creatives that I have listed at the bottom of this article. Make a list of all the things you want to organize or track. Choose one and only one to implement. Draft/create your one spread, tracker or check list on a blank sheet of paper. Transfer it to your bullet journal. Challenge yourself to get in the habit of using and completing your one spread daily. Once you have formed a solid habit, go back to your list in #1 and choose a second spread to make. Do not start a new spread until you are successfully using the ones you have or have chosen to abandon a spread that isn’t working for you. I’m going to be honest here. Bullet journaling is not for everyone. It is more work than a traditional daily planner. But a bullet journal has so much more potential to organize your life beyond keeping track of your appointments or to do lists. And just like a regular journal, it only works if you learn to use it everyday. The extra time you spend working on your bullet journal as opposed to a regular dairy, helps you to reinforce in your mind and on paper, those things that you want to prioritize in your life. And that is what makes a bullet journal so powerful when used correctly. Making it nice to look at on a daily basis makes it easier to re-enforce the daily habit of using it. Choose a colour theme. Use the same three colours throughout your spreads. 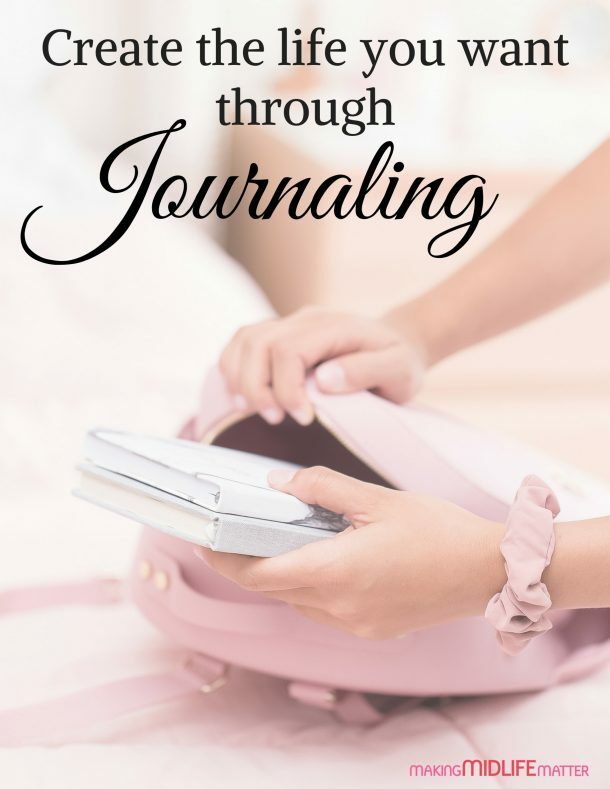 This will help your bullet journal look cohesive and stop the overwhelm from too many choices. Choose an overall theme. Do you like flowers, horses or sunsets? Whatever it is that brings you joy or that you often mindlessly find yourself doodling, that’s what you should choose. Doing the same enhancements over and over again will make even the least artsy person better at drawing. Find tools and supplies that not only save you time (like calendar stamps), but also add flair (like washi tape). Ready to take your bullet journal to the next level? are a great way to pretty up your spreads too. You can find stamps online, at your local scrapbooking store as well as at your dollar store.
. You can find stickers for flowers, animals or any other theme that you like. I don’t know about you but I hate mucking up my journal with to do lists. And sometimes, I don’t want to take my journal with me (or i need to give my list to someone else to complete). So I have found these to be the perfect solution. I love the built in tabs too! This is the best hack ever! There are tons of free bullet journal template printables on Pinterest. Why not use what some other creative person has already made. All you have to do is print them on these labels that fit the A5 format and stick them right into your dotted bullet journal. Then all you have to do is colour to dress them up! to get into the small spaces. Bullet journaling can be a lot of fun as well as a tool to get you super organized. Don’t think it isn’t for you because you aren’t artsy. 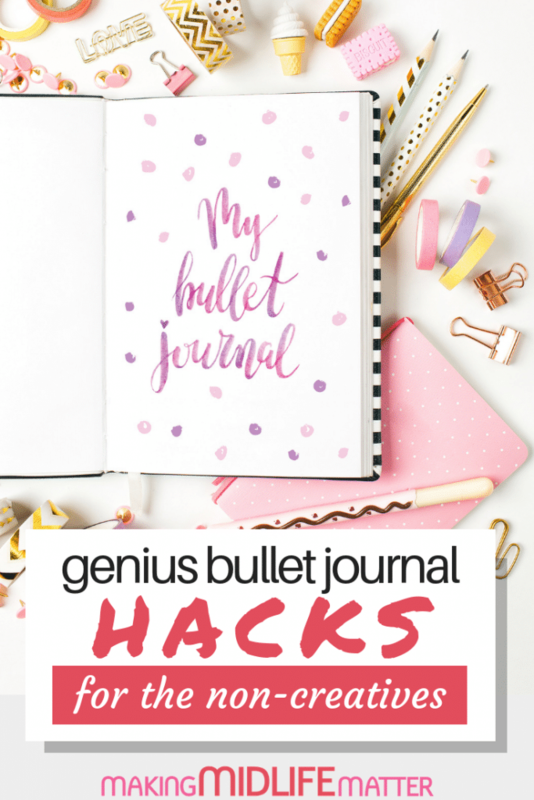 There are lots of bullet journal hacks that can make your journal look pretty and still be functional. And you will get better at it. I promise you. As long as you challenge yourself to use it daily. Do you have any bullet journal hacks for non-creatives?